If you’re looking for a pool table service to be done correctly, then you’ve come to the right place. We’re a pool table movers company with decades of experience, taking care of diverse pool table services to give you the best experience. for our customers with the best customer service using the most technologically advanced systems in use today. Call our professionals to get a price on a pool table service or if you only have general questions. Your satisfaction is what has made us the largest and most professional company in the industry. 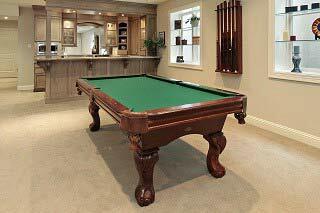 We consider that the most important part of buying a new or used pool table is how well that it is put together. You can be sure that our pool table installers are the best possible because we’re backed by the American Billiard Installers Association with an exclusive 1-year service guarantee. Our pool table technicians are professionally trained, with years of experience. Proudly servicing pool tables in California. We can also cover any pool table service near Stockton and surrounding areas, such as San Jose, Sunnyvale, Santa Clara, San Francisco, Oakland, Hayward, Sacramento, Roseville, Stockton, Lodi, Modesto, Vallejo, Fairfield, Lathrop, Manteca, Tracy, Ripon, Galt, Brentwood, Oakley, Riverbank, Antioch, Oakdale, Elk Grove and more around Stockton. Since we have been in the billiard business for so long, we naturally have become experts in pool table servicing. We specialize in pool table moves and we can professionally perform pool table setup, pool table recovering and pool table refelting with the best equipment. We have the ability to offer the highest quality billiard repair and services in the area. We work with pool table installers in many areas and we have been exposed to the common practices in the pool table service business at the highest level. Make sure you tell us in advance if there’s a pool table refelting service to be taken care of at the time of installation since the best time to add new material is when the pool table is torn down. Why Calling Professional Pool Table Installers? The proper equipment and tools are necessary to ensure a flat, level and consistent installation of any billiard and pool table. Remember when shopping around for a qualified pool table installer that the cheaper their price is, the less interest they have in taking care of their client, especially after a rushed job has been completed because they only charge enough to take your business from the competitor. In most cases, this is the only tool they have for getting your job and so many consumers fall for the cheap price they can convince you very quickly to give them your money. In most cases saving money on a pool table installer service is a very big mistake. What’s involved in our services? Our installers can take care of your pool table and install both new and used pool tables. We come to your home, cover rails and professionally install and level all 3 pieces of slates using precise leveling equipment, we have thousands of pool tables setup over the decades. This is what you need if the table is already in the room and you need it professionally set up, leveled, and you’re felt put on. We make the pool table simple and clean. We set up all billiard and pool tables to necessary pool table specifications to ensure an excellent game for you. Our installers will professionally tear down your billiard table to relocate it to the new location, we will assemble your pool table with expert leveling and install the existing pool table felt. We handle everything from start to finish and work with professional technicians only in order to give you the best pool table moves service in town. With countless pool table installations proudly made in the past, we’re your best option. Our pool table installers will give you the best service, guaranteed by the ABIA. Feel free to give us a call with any questions that you may have. We offer two options for billiard felt in several colors to match your decorative needs. Standard felt and tournament worsted material for the more serious player, if you want your billiard investment to play to its maximum potential, go with the pro tournament felt! Every pool table refelting service is guaranteed. Disassemble a billiard table that is 3 piece slate and professional pool table assembly reassemble it in a different room. We have installed thousands of pool tables in the past 8 years and have over 20 years of experience doing it. Stockton Pool Table Movers is a member of the ABIA and takes pride in all of the work that we do. We also guarantee the quality of our workmanship. Make sure you know your pool table room dimensions when calling for quotation because it may affect the price. You can measure your billiard table with our pool table room sizes guide page. Please click on the tabs at the top or bottom of the site to see some of our pricing deals on moves, installation, and recover/refelt. Once you have an idea of what type of work you need completing, call us to get a free quote.